Workers at the Tae Kwang Vina plant, 19 miles northeast of Ho Chi Minh City are demanding higher salaries and increased cost of living allowances. With the rapid rise of inflation, now at 9.5%, the cost of living in Vietnam has risen sharply, with prices being 10% higher than they were a year ago. The average monthly wage at the plant is $62. "Given the fact that inflation is so high now, it is hard to say they are being too demanding," said Kieu Minh Sinh, an official with Dong Nai Provincial Trade Union. Following an increase of 25% in the minimum wage owing to widespread industrial action by Vietnamese workers last year, the minimum wage is again set to rise by 12% in January. 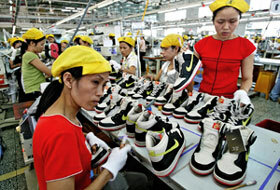 Nearly 300 strikes occurred last year at foreign-owned firms in Vietnam.